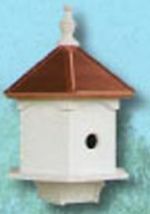 Birdhouses are available in pressure treated wood or poly lumber. 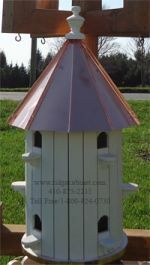 We also have planters and post for bird feeders and bird houses. Many styles and sizes to choose from. Call or stop by for more information. 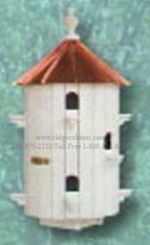 We have a wide selection of wood and vinly birdhouses available. 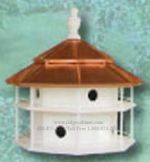 Specialty Birdhouses: Wren Birdhouses, Handcrafted wood bird houses like our Bluebird house, the captain's birdhouse, and a moose shaped birdhouse. Please call for other styles available. Note: Horse barn styles, availability, and prices are subject to change without notice. limited in supply limited in supply or are no longer available. Scroll down and look through our products. When you find what you are searching for, copy the item description (usually in red) and then fill in our QUOTE REQUEST FORM to find out how much it will cost to customize the item the way you want it and / or to have it shipped to your location. Many styles and sizes to choose from. Call or Stop By for Specific Prices. 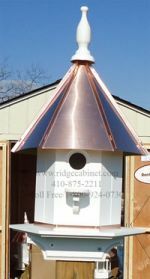 Providing quality portable buildings and sheds, custom built sheds, garages, carports, gazebos, horse barns, animal shelters, pet houses, rabbit hutches, bird houses / feeders, dog houses, dog kennels, bird feeders, lawn furniture, picnic tables, lawn ornaments, mail boxes, mail box posts, play sets, swings, swing sets, playground equipment, playhouses, and wood crafts throughout Maryland, Virginia, West Virginia, Pennsylvania including areas like Taylorsville, Westminster, Frederick, Mt Airy, New Market, Sykesville, Eldersburg, Finksburg, and other neighborhoods in Carroll County, Baltimore County, Montgomery County, Howard County, Frederick County, Baltimore City, and Anne Arundel County.